When Volvo entered their ultra-tuned 850 wagon into the 1994 BTCC, fans loved it. But why did Volvo chose the 850 wagon to shake up the racing world? In 1994, Volvo shook up the touring car world by enlisting their supposedly-soccer-mom 850 wagon in the British Touring Car Championship (BTCC). Many laughed and drivers sneered. And even though the car didn’t win any races during those golden years of the BTCC, many of us still picture Volvo’s iconic offering when we remember that long-ago time. Turns out, we can all thank a Volvo factory’s shortage for this blip in motorsports history! Volvo had been out of the racing business since 1986, when it quit the now-defunct ETCC (European Touring Car Cup) after winning the cup the prior year with their 240 Turbo (pic below). By the early 90s, Volvo’s senior vice-president, Martin Rybeck, felt it was time to shake up the company’s well-won ‘safe’ image and jump back into the racing scene – with the new 850 sedan as the vehicle of choice. Volvo quickly hired Swedish performance company Steffanson Automotive (SAM) to develop a prototype racing-version of the 850. As the legend goes, when SAM visited the factory to pick up the 850 bodyshell, only wagons were available. On a tight timeline, instead of waiting for a sedan model SAM just grabbed a wagon and went about their way. When VP Rybeck got wind of the racing wagon – unheard of in the BTCC – he recognized a huge potential to drum up some PR for Volvo’s momentous return to motorsports. They hired out their old competitor from the 80s – TWR (Tom Walkinshaw Racing) – under a 3 year contract to build out the vehicles. TWR focused on the technical side while Volvo provided marketing, support, and PR. After a bit of testing later on, turned out the wagons actually enjoyed greater downforce than the sedan thanks to their long, flat roofs. While this was certainly a bonus, in the end the decision to continue moving forward with the wagon was a marketing decision. When hired, Rydell was just 26 years old, but already had close to 10 years of experience with track racing. From somewhat humble beginnings winning the Swedish 100cc go-kart championship in 1985 and 1986, Rydell joined the Swedish Formula 3 (F3) team in 1986. Staying with the team for 3 years and taking home 2nd place two years in a row, Rydell moved to the British and Japanese F3 teams before switching over to Volvo’s newly-formed BTCC team for the 1994 season. Rydell’s teammate, the more experienced (and older) Jan Lammers already had 20+ years of experience in a variety of races, including F1, Le Mans, IndyCar, F3, and Formula 3000. Lammers began his racing career way back in 1973 – at just 17 years old – when he joined the Dutch Touring Car Championship. By 1994, he was racing sports cars in the Le Mans with TWR/Jaguar and even won the championship in 1988. Joining Volvo’s BTCC team was Lammer’s first step back into the touring car racing since he first hit the track in the early ’70s! With a well-experienced team and a couple highly-tuned 850 wagons, Volvo officially launched their aptly-named “Back on Track” program in April 1994 at the BTCC’s first race of the season. While touring cars retain the appearance of normal production vehicles, under the hood and inside the cabin, Volvo’s BTCC 850s were anything but standard! The BTCC requires all racing vehicles to follow certain regulations designed to keep costs low and all vehicles on an equal playing field. During the 1994 season (under FIA Super Touring class 2 regulations), they capped engines to 2 liters, turbos were a no-no, all vehicles had to be solely front-wheel drive, and the body remain unchanged. In addition, engine speed was capped at 8,500 RPM and vehicles were limited to a minimum weight of 950 kg (2,094 pounds). To make the 850 race-worthy, the development team needed to get to work. They took on typical weight-saving and safety measures, stripping the inside down to the metal and adding a role cage. For better weight distribution, the development team also lowered the engine in the bay and set it as far back as possible. The image below compares Volvo’s highly-customized 850 engine for the 1994 BTCC to a standard 850. Check out that air intake! With the 850’s turbo 5 cylinder engine coming in at 2.3 liters and 222 HP, Volvo and TWR had to drop the engine size down to 2 liters. If they really wanted to compete with the other cars, they needed to take some drastic measures to increase the car’s power. The team started by simply studying the rules, figuring out where exactly they had room to tinker, and moving on from there. Understanding exactly what they could and couldn’t change, they began by chopping off portions of the cylinder head to fit bigger cams. They also machined the face of the head into a wedge to optimize valve angles. After a few other modifications, they had their engine. With these clever reworkings, they created a 2 liter NA engine that produced an astounding 290 HP – 30% more powerful than the standard, larger engine! Even though they were original, in the end each of these special cylinder heads cost Volvo between $20k and $23k (in mid-90s dollars). Yikes! Catalytic Converter: First car in the BTCC to incorporate a cat converter, soon to be mandatory across the BTCC. 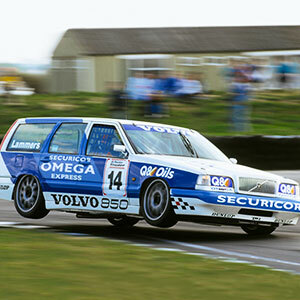 Rumor has it that after the 1994 season, Volvo required all of the 850 wagons developed for the BTCC to be destroyed to keep the secrets of their speed intact. Thankfully though, they weren’t 100% successful! One is now in the Volvo Museum in Sweden. Another (though just the shell) was hidden away in storage in Mijdrecht, The Netherlands, until 2010, when driver Jochen Pehtke purchased it. He added a 2.3L turbo engine and began racing it in the 2011 Dutch Supercar Challenge. How Did the 850 Wagon Do? How did the 850 wagon fare in the 1994 BTCC? Not great, but not terrible either. With the 850’s good downforce, the wagon pulled ahead in the straightaways, but just couldn’t handle the corners like its smaller rivals. With its ‘unusual’ weight distribution, the wagons suffered from oversteer, hindering their abilities to quickly move into and out of corners. Volvo enjoyed 5th place at Oulton Park – its best placement – with Rydell coming in 14th overall (out of 17) for the season and Lammers one seat behind him. This wasn’t a huge upset for Volvo. From the get-go, the company saw 1994 as a practice year – a time to get their feet wet, ease back into the racing circuit, and drum up some publicity. In fact, Volvo’s drivers couldn’t even practice driving the vehicles beforehand! Volvo was cutting it so close with the 850’s production that driver Rydell’s first test drive on an actual track was the day of their first race! Before that, he’d only driven it a few hundred meters outside TWR’s workshop. Even with the wagon’s lackluster standing, Volvo had a winner. The 850 wagon fully grabbed the opportunity that VP Rydeck had envisioned and ran with it. The 850 wagon is now an icon of 90s touring cars and showed the world that safety doesn’t have to be the opposite of excitement – they can coexist. Rydell and Volvo certainly had fun with the 850 wagon and the ’94 BTCC, and their publicity experiment certainly paid off. Unfortunately, the 1994 season was to be the only year Volvo used the wagon, turning to the sedan for the ’95 season. At the end of the 1994 season, driver Lammers decided to leave Volvo and the BTCC, returning to sports cars for the 1995 season, racing in 24 Hours of Daytona, and 24 Hours of Le Mans the following year. Rydell stuck around and Volvo hired Englishman Tim Harvey as Lammers’ replacement. For the 1995 season, the BTCC changed regulations to allow spoilers on vehicles, as long as they were an option on the production vehicle and didn’t stick up above the roof of the car. We can actually thank Alfa Romeo for this change, as the previous year they’d been splitting hairs on the rules, running large spoilers and adjustable front splitters to slip through the air more easily, helping them clock in first place for the 1994 championship. After much hullabaloo from the industry, BTCC simply removed the ban on spoilers and other aerodynamics-enhancers for the 1995 season. Volvo found that a spoiler on the wagon wouldn’t do much for its performance, but could vastly help the sedan. They had to decide between keeping its publicity-hungry wagon or moving to the more-traditional 850 sedan for the 1995 BTCC. With some experience under their belt and publicity already drummed-up, Volvo switched to the sedan. The move paid off for Volvo. After the switch, driver Rydell came in third place overall for the following two years (1995-1996). In 1997, Volvo switched over to the S40, with Rydell placing 4th that year. Finally, the following year, he placed 1st overall in the entire BTCC! Even with Volvo’s 1998 series win with the S40, when we think BTCC and Volvo that classic image of the 850’s boxy body, tilted up on two wheels, inevitably comes to mind. It didn’t win any races – not even close – but it’s forever stuck in our collective conscience. Even if you don’t know Volvo, somewhere deep down Volvo and Racing seem to just go together for some reason. Want to hear the full story on the S40 and Rydell’s win? Watch out for our next installment on the BTCC! For no reason at all, here's a pink 240 wagon I spotted in Denver yesterday. Next PostNext V60 Interior Volume vs. Golf SportWagen / Alltrack: Which is bigger?